Welcome to Arizona. 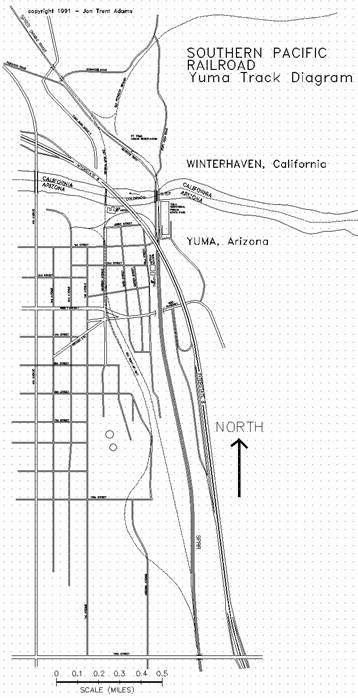 Although technically the next five-mile section of railroad is part of the Gila Subdivision, Tucson Division, Rule N (as per the Espee Timetable) specifies that jurisdiction of these few miles lies under the Yuma Subdivision of the Los Angeles Division. Yuma is the largest town for at least 100 miles, rivaled only by El Centro, about 60 miles west. The reason for the town's existence hinges pretty much on the fact that historically there was and still is a good crossing of the Colorado River available right where the tracks now cross. Because of this, traders set up shop here, folks moved in, etc. The Yuma Territorial Prison was built here in 1876 adjacent to Fort Yuma which was across the river on the California side. The Southern Pacific rolled the first locomotive into Arizona on September 30, 1877. The weather is pleasant in the winter and furnace-like during summer; long ago the heat was a bit more bearable but the intense agriculture along the river has forced up the humidity and so made the heat more sweltering. As along most of the rest of the railroad, the Espee shares their right-of-way with oil and gas pipelines and telecommunications companies. Signpost WB "END OF DOUBLE TRACK"
To the east the railroad runs under double-track ABS (Automatic Block Signal) control all the way to MP737.4 at the east end of East Yard. Westbound the railroad maintains single-track CTC (Centralized Traffic Control) jurisdiction for just 0.4 miles to MP732.1, where two-main-track CTC begins and continues west. The following five miles of double track are run with respect to the current of traffic: the #1 (north) track provides westbound service while the #2 (south) track sees eastbound traffic. All of the signals controlling this double track are set up for operation in those directions. For instance, any time a westbound train is run on the south track, it is said to be running against the current of traffic (ACOT), and so is controlled by certain rules governing that service. The turnout that joins the #1 and #2 tracks immediately east of the Colorado River Bridge is a spring switch. This means that not only can route selection through the switch be chosen in the standard manner by throwing the switch lever to move the points from side to side, but that if a train makes a trailing movement through the switch (in this case, from east to west from the #1 track to the single-track mainline) the wheel flanges can actually force the switch points to the proper position. When the last wheels of the train pass through the switch, the points will return to their normal position, which allows movement eastbound from the single-track mainline to the #2 track. It takes a big spring to hold the points steady. On the low hill immediately along the side of the tracks rests the old Yuma Territorial Prison, built in 1876 by its own inmates. It is now the Yuma Territorial Prison State Historic Park, and well worth a visit. A wide, dirt path leads across the tracks and up the hill to the museum. Besides all the historical information and artifacts concerning life in general in the surrounding country, the museum also displays a few drawings and photos of the river crossing: before the railroad; after arrival of the railroad in 1877; and lastly, a particularly nice photo (hidden, of course, in a back office) taken of the old highway bridge during its construction, before the current railroad bridge was built. Of course, that old highway bridge (St. Thomas Road) is now barricaded and available only as a footbridge for pedestrians. They also sell a postcard photograph of the original turnstile bridge across the river. Also note the "No Trespassing - SPT Co." sign at the east portal of the Colorado River Bridge. The west-facing switch off the #2 track just north of the Interstate 8 overpass is the Yuma Yard lead; this drill track parallels the double-track main all the way to the end of the East Yard at MP737.7. The east-facing switch on the yard lead under the overpass is the junction point with the Yuma Valley Railroad. The YVRR is an Espee branchline that extends about six miles downriver to a water desalinization plant. At one time the branch continued all the way down the Yuma Valley to the Mexican border. The Espee MofW facility is south of the Interstate overpass; the access road to this yard leads in from the intersection of St. Thomas Road and First Street, back at the stop sign at the foot of the old highway bridge. This station was built in the mid-Twenties to service the new mainline when the current Colorado River bridge was opened. At one time it was quite a busy passenger station, but those days are long gone now; the Amtrak trains go through before dawn. However, the freight trains stop to bring on new crews for the next section of their trip. The original station building is now home to the Yuma Art Center, and is very well-kept. There are the assorted bits of Railroadania selectively strewn about, and a brief "Depot Desert Trail" on the north side of the station building that hosts a display of the different flora of the surrounding desert. There are two train platforms; the one between the tracks is accessible via a passenger subway that lies just south of the Art Center. Station parking on Gila Street is available, and the best spots are under the shade trees in front of the Art Center. The present SP building is the two-story structure just south of the passenger walkway; the SP Police hang out on the first floor, and their vehicles are the white trucks parked out front. The second floor houses the crew change quarters, the Amtrak ticket office, and probably the local Yuma Line Desk operator (that's the Yardmaster, more or less: Rule 7(a) specifies that "Trains must not enter or depart yard unless authorized by trainmaster"). On the east side of the tracks, across from the station, are the footings of a long-gone water tank. This is technically the end of the Los Angeles Division and the beginning of the Tucson Division; however, Rule N in the Espee Rulebook specifies that the first five miles of the Gila Line (to the east) is under the jurisdiction of the Los Angeles Division. A dirt incline leads up from Gila Street through the SP employee parking lot; the access road continues along the west side of the tracks to at least 16th Street. This is private property, and very close to the Police Station, however. They might be a little jumpy. The tracks cross Giss on a 50'-steel through-plate girder bridge; the bridge is wide enough to also provide room for the westside access road. Giss Parkway is also the local offramp from Interstate 8 in both directions. A path along the east side of the right-of-way is available from the eastbound freeway onramp; this route parallels the railroad to about MP734, then veers east to connect to 16th Street. According to the timetable, Rule 301 specifies that the "Signal 7333 governs westward movement through crossover to main track only and will remain dark until crossover switch is open". The original route through Yuma was along Madison Street, two-tenths of a mile west. That mainline then turned at Third and Madison Streets and joined the present right-of-way. There is still plenty of evidence for this routing, especially since most of the intervening ground is still empty of redevelopment. The crossover allows westbound traffic on the #2 (south) track to move onto the #1 track. The switch on the #2 track, just east of the crossover, provides access to the east end of the Yuma Yard lead. Often, if a westbound train will be laying over at Yuma for a while, the train will come down the #2 track to this switch and then set out in the yard, clearing the mains. On the west side of Interstate 8 at the 16th Street offramp is a little-used frontage road that heads north and turns to dirt in about a quarter-mile. This road leads to a large open area which provides all kinds of access to the east side of the railroad right-of-way. Much of the ground is soft but judicious driving techniques will keep all but the hopeless out of trouble. A path extends north to Giss Parkway. Rule 241: "Train or engine must be authorized to move against current of traffic before passing signal 7343". An obscure road leads down from 16th Street west of the railroad entrenchment. This path quickly turns to dirt but provides a route all the way up to the SP depot at MP732.8. Access along the east side of the tracks is limited to foot. Access along the tracks to the east is available from the dirt parking lot west of the McDonalds; a fine path passes around the west side of the "YUMA" water tank, then drops down to parallel the tracks at about MP734.6. The mainline begins to curve to the east. The wye is south of the mainline and is switched off the drill track that parallels the main. The Diesel Facility performs minor service on locomotives, mainly just enough to keep them running to either West Colton or Tucson/El Paso, where more complete facilities exist. The plant is on the south side of the right-of-way, sitting in the middle of the triangle formed by the wye trackage. The wye tail track juts out to the west about two-tenths of a mile. Speed limit on Diesel Facility trackage is 5 MPH. The access path along the north side of the tracks continues both east and west; the soil is a little silty but passable. To the west the road eventually gets to 16th Street; to the east there is passage under the Pacific Avenue Overpass. A dirt road leads in from E. 20th Street, crossing over the 0353 spur to join with the northside access path. The 0314 switch connects the east leg of the wye to the drill track that parallels the mainline to the south. Spur 0353 joins the north main; the spur leads west and downhill to serve a couple of industries that front on East 20th Street. The north trackside access path continues east all the way to the Pacific Avenue Overpass at MP735.6. Both of these industry spurs connect to the drill track that parallels the double track mainline along its south side. The northside access path passes under the overpass bridge and continues both east and west. A rough trail from the southwest corner of Pacific Avenue and E. 20th Street joins the path here. A signal bridge lies east of the Pacific Avenue Overpass; on it are two signals controlling eastward progress on the #1 (north) track through the crossover to the west end of the East Yard ladder track. East Yard stretches east for the next two miles; it is often used to hold trains for extended periods, and it is also where outgoing produce trains are assembled. The single signal controls westward movement on the #1 track. The dirt path along the north side of the tracks continues west under the Pacific Avenue Bridge. To the east the trackside trail becomes difficult; the best path is to the north of the right-of-way, on paved Gila Ridge Road. Avenue 3E is an offramp from both directions of Interstate 8, about 0.5 miles north of the railroad. Gila Ridge Road intersects Avenue 3E at the north end of the overpass, and provides limited access to the railroad both east and west. Most of the right-of-way access to the east involves driving around the back of shipping facilities and storage yards and such. An east-facing spur separates from the south side of East Yard and parallels Avenue 3E south, throwing off a further few east-facing spurs on its way to the Marine Corps airfield that doubles as Yuma International Airport. There is limited access along the north side of the tracks from the Avenue 3E bridge to about MP737.2. Of course, with a proper four-wheel drive vehicle, the sky's the limit (but you weren't interested in the sky, it was the tracks you were after). For everyone else, most all trails lead to Gila Ridge Road, about 0.2 miles north of the railroad. This marks the end of the Yuma Yard limits, which start back at MP732.5. Here at the east end of East Yard, the ladder track joins with the drill track that has paralleled the main line since MP732.6. A east-facing spring switch, just like the one back at MP732.5, controls the junction, allowing eastward traffic on the drill lead to get onto the #2 track without requiring the switch points to be controlled elsewhere. To the east the railroad runs under CTC (Centralized Traffic Control) procedure nearly 250 miles to a point just west of Tucson. Westbound the railroad maintains double-track ABS (Automatic Block Signal) control all the way to MP732.5 at the east end of the Colorado River Bridge. Toward the west, five miles of double track are run with respect to the current of traffic: the #1 (north) track provides westbound service while the #2 (south) track sees eastbound traffic. All of the signals controlling this double track are set up for operation in those directions. For instance, any time a westbound train is run on the south track, it is said to be running against the current of traffic (ACOT), and so is controlled by certain rules governing that service. The #1 and #2 tracks join at a fancy, east-facing equilateral turnout; this style of switch is used so that east and west traffic need not slow when choosing one route or the other. All in all, it's a very impressive piece of trackwork. A dirt path leads to the tracks from Gila Ridge Road; turn south on Thomas Avenue and follow it to its end; either park and walk the remainder of the distance or, if spirited, cross over an industry spur next to a packing plant and the tracks await. This is the end of the jurisdictional reach of the Los Angeles Division, Yuma Subdivision; to the east lies the Tucson Division and its Gila Subdivision. A white post, five feet high and about six inches square is planted in the dirt along the south side of the mainline, marking this division point. Carton Yard & Field Truck Operations"
This path will lead more or less due south to a large open area near the tracks. Walk the rest of the way. Attempting to drive west along the north side of the right-of-way is difficult; there is a path that eventually crosses an industry spur at MP737.5. This path then leads through a graveled parking lot to Thomas Avenue, which then returns to Gila Ridge Road. To the east please refer to the Gila Subdivision Guidebook.